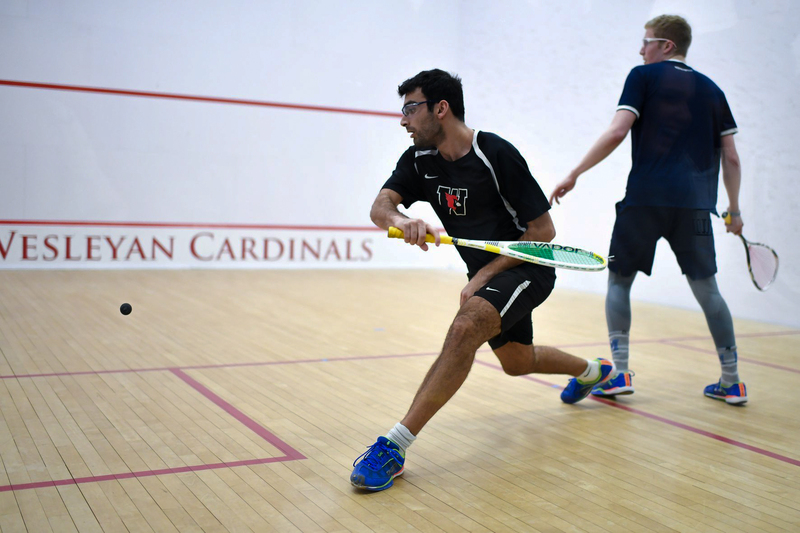 Heading into the first weekend of February, the men’s squash team had a tall task ahead of it, playing a gauntlet of rival schools in the annual NESCAC tournament in Middlebury, Vt. The first matchup had the Red and Black going up against Tufts. The top of the ladder fought valiantly, but eventually Wesleyan was defeated. For many teams, this early loss could have spelled devastation for the remaining games of the tournament, but the Cardinals were able to rebound strong and turn their game around. The next matchup pitted Wesleyan against Hamilton, which it was seeing for the first time this season, after a prior match was cancelled. Coming off the tough match with the Jumbos, the Cardinals delivered a decisive victory, annihilating Hamilton 8-1. This matchup featured sweeps from seven different members of the Cards from the top to the bottom of the ladder. Wesleyan seniors and team captains Kevin Le ’19 and Yahya Ladiwala ’19 also had spirited performances, winning their matchups in hard-fought four-game matches. The day was beginning to turn around for our Cardinals, but they were not done yet. Next, Wes faced its biggest test of the day: a grudge match against ’CAC rival Conn. College. In their first match back in December, the Cardinals fell to the coveted Camel team, but history was not to repeat itself. This time, in the final match of the tournament, the Cards had a complete team victory, taking the win after a tight 5-4 match. This performance again featured wins from the top and bottom of the ladder. Sean Choi ’21 dominated with a sweep at the top of the ladder, while Scott Ji ’20 won in a five-game thriller from the nine position. Perhaps the gutsiest match of the day came from Bienstock. From being down two-love, Bienstock battled back and eventually triumphed in five games, in what can only be described as an instant classic. “Our whole team really got up for our rematch against Conn, and it felt incredible to finally take them down,” Bienstock said. Overall, this was a spectacular day for the men’s squash team. Clearly, Kerr was thrilled with the team’s mental toughness this weekend, as well as the improvement from the month of preparation and hard work over the break. Moving forward, both the men’s and women’s teams face a series of tournaments in the upcoming weeks. Next week after a short break in play, the women’s team will travel to Trinity for the NESCAC tournament. “We have improved a lot since our first matchups against these teams, and we are ready to give them our best next weekend,” Carly Blue ’22 said. The Cardinals will need to bring their A game to NESCACs for a trying circuit of matches. Yet after a successful season with a strong finish over break, they will hope to advance even further in the NESCACs than last year—beyond the quarterfinals. For the men’s team, the next test will be a Sunday matchup on Feb. 10 against NYU and Fordham, the last home match for the seniors. The team will continue play at Nationals on the weekend of the 15th. Coach Kerr and the team believe the NESCACs have prepared them well for upcoming competitive play. “I am excited to see us perform for nationals after we upset Connecticut College, which boosts our ranking for the tournament,” Le said. With another difficult stretch of the season coming up, the men’s team will look to build off their successful weekend back on the court soon.